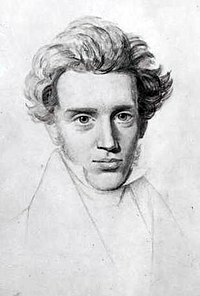 ↑ This classification is anachronistic; Kierkegaard was an exceptionally unique thinker and his works do not fit neatly into any one philosophical school or tradition, nor did he identify himself with any. However, his works are considered precursor to many schools of thought developed in the 20th and 21st centuries. See 20th century receptions in Cambridge Companion to Kierkegaard.